Smoke Detectors: What's the Best Distance from Your Ceiling? Smoke Detectors: What’s the Best Distance from Your Ceiling? Smoke detectors are some of the most important things in your home, but where should they be appropriately placed? Whether you’re hard-wiring your smoke detector or simply installing a battery-operated one, you might be wondering where the correct placement for it is. Especially in homes that have vaulted ceilings, it can be difficult to determine where they should go. Where Should You Place a Smoke Detector? Smoke detectors are designed to detect rising smoke inside of your home. Smoke and heat goes up, so a smoke detector that is lower to the ground may not be able to detect a fire early. This is why the placement is important. It could seem as though you actually want them as low as possible (as close to the fire), but that’s not true. You want them to capture the smoke that is rising. By law, you are required to have smoke detectors in your home. 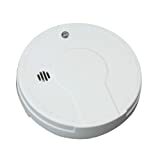 However, while most know this and put up smoke detectors to keep their family and home safe, they may not realize that the smoke detectors need to be properly positioned within the home to ensure that they are able to do their job and to maximize the chances of them detecting a fire. Because of this, many people have started putting their smoke detectors on the ceiling itself, with the rationale that it will then catch any smoke as it rises. But there are also other, lighter gasses that can rise in the event that something, such as a couch, is burning. These gasses will displace the smoke, pushing it further down. Confusing, but the answer is simple: place a smoke detector about 12 inches from the ceiling on the wall. 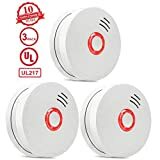 This gives enough room for any gasses, while also making sure that the smoke detector detects the rising smoke and as an added bonus you can see the smoke detector red light in case there is something wrong like the battery is low. Where Else Should a Smoke Detector Be Placed? Inside of kitchens, but not right up next to cooking appliances. Inside of large family rooms. In general, the more smoke detectors you have, the better. This is especially important in two-story homes, in which fire could spread from either level. Don’t forget that smoke detectors also fulfill another valuable role: they also detect carbon monoxide poisoning. 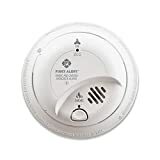 Most modern smoke detectors should also be able to detect this extremely dangerous gas, and if you’re installing new ones, you should make sure that they have this feature. This is another reason why liberal use of smoke detectors can be important. What About Homes With Vaulted Ceilings? Homes with vaulted ceilings may wonder exactly where their smoke detectors should be placed. The problem with a vaulted ceiling is that smoke is going to rise, but if your ceiling is an irregular shape, it can be difficult to identify how much could be displaced by gas. If you have a vaulted ceiling, you should put your smoke detector around within 3 feet of the peak, but not in the first four inches. But this could change given the size of your home, the size of the room, and where the room is. All of these may be considerations for a professional. The placement of your smoke detectors is important, because there are many things that most people don’t think about — such as vaulted ceilings, or whether the smoke could possibly be displaced by gas. Because of this, you may want to have a professional come in to initially place and install your smoke detectors. For more information, contact the experts at Protect America.